Mail Pouch of George Harlow Griswold from the collections of the Worthington Historical Society (WHS) may be used for educational purposes as long as it is not altered in any way and proper credit is given: "Courtesy of the Worthington Historical Society, Worthington, OH." Prior written permission of the WHS is required for any other use of Mail Pouch of George Harlow Griswold. Contact WHS at info@worthingtonhistory.org to request permission. Mail Pouch of George Harlow Griswold is realia. 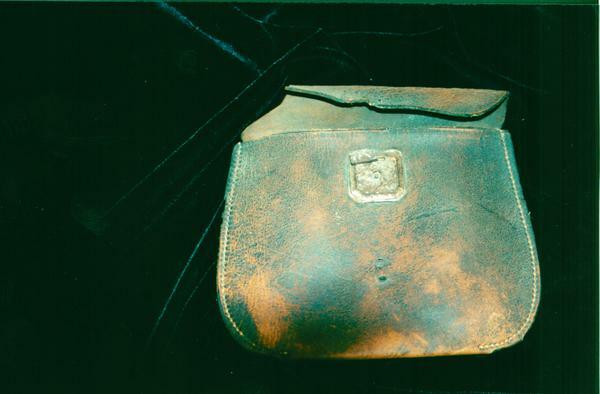 This worn leather mail pouch was used by George Harlow Griswold, who covered the mail route between Zanesville and Worthington. The small size of the pouch is due to the difficulty and expense of sending letters. Letters longer than one page were more expensive. Postal service was much different in the early 19th century. The first stamps were not issued until 1847. Before that time, the cost of delivering the letter depended on the distance it would travel. A one page letter that went 30 miles cost $.06 cents, while one going 450 miles would cost $.25 cents.Letter carriers collected $.02 a letter for delivery from the recipient. Since the average wage for skilled labor was $1.25 to $1.50 a day, letters were expensive. Worthington's post office was usually situated in a general store, tavern or inn, or even homes. Not until the 1920's, with the advent of city delivery, did the city have a freestanding postoffice built solely for that purpose. The Worthington Memory identification code is whs0033.